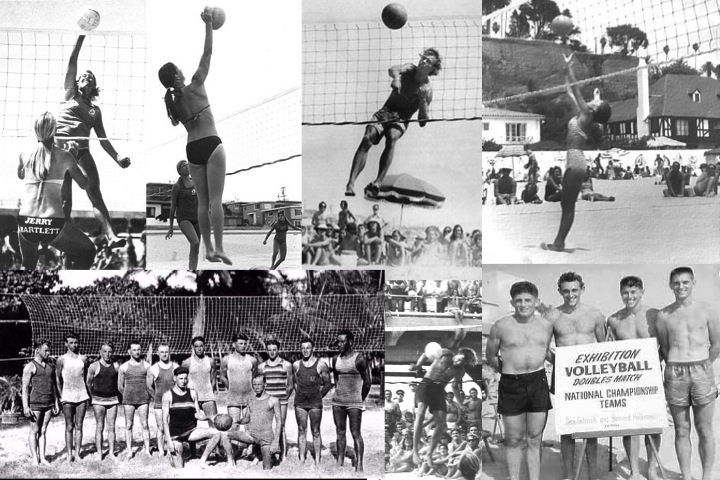 Beach volleyball was birthed on the sands of SoCal. Pick your beach and you will be sure to find a volleyball story (or at least local gone to the NCAA or the AVP). This compilation is mostly from the 1960s. Sandy Beaches are everything to us here in Southern California, a central pillar of both our cultural identity and economic engine. They are where we birthed surf culture (on beaches like Huntington and Surfrider), invented beach volleyball (on beaches like Manhattan Beach and Redondo), trained our young people to fight the axis powers of WWII (on beaches across Coronado Island and Mugu Lagoon), have filmed our entertainment for a century (on beaches like Leo Carrillo and Will Rogers), see the manifestation of climate change/sea level most clearly (at Ventura’s Surfer’s Point Beach), pump ourselves up to become the next action movie star or guvernator (this really only ever happens on Venice…check out Jim’s killer glass if you go), stare over the tops of our sunglasses at scantily clad people (on any beach you can think of this holiday weekend) and first learned how devastating an oil spill can really be (on beaches across Ventura and Santa Barbara Counties in 1969). 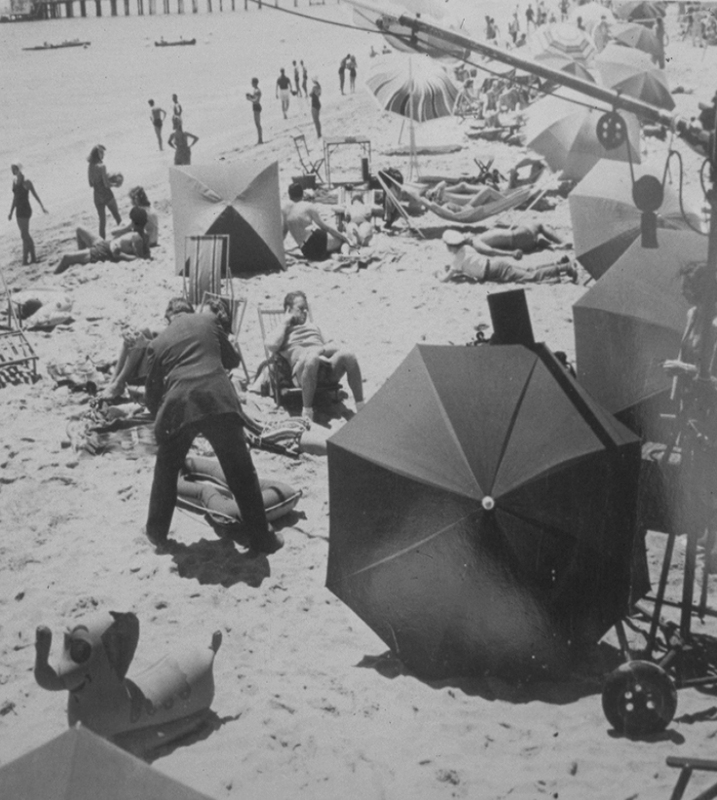 Turning Mugu Beach (near the historic pier) into the South Pacific in the era of silent films, 1937. 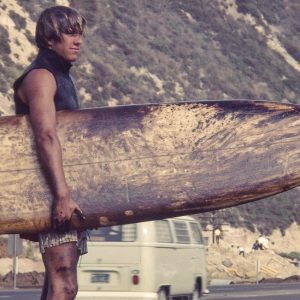 Our most recent, state-wide economic data comes from a colleague (the great Dr. King) up at San Francisco State University way back in 2002 who showed that California’s sandy beaches generate about $21 billion dollars EACH YEAR (in 2002 dollars) in both direct spending and generated taxes. That’s billion with a “b” and that probably seems more profitable than either a Presidential Election or a WholeFoods kitty-corner to a Bel-Air Yoga Studio. In sandy beaches we’ve got an ecosystem that is part culture cauldron and part money mill. The downside is that we don’t seem to give sandy beaches their due when it comes to doing the most minimal things we can to keep them in place and healthy. We are more than happy to armor our coastline, pave over our dunes, dam our rivers, and stick jetties out into the sea to cutoff or otherwise screw with sand movement, the central lifeblood of our beach systems. 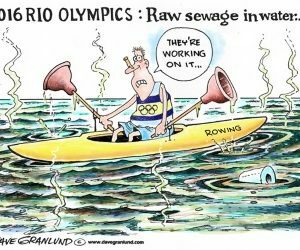 And each year we spend a few tens of millions of dollars on beach nourishment and other forms of beach restoration. In the world of “Return On Investment” beaches are either a cash cow, an incredibly poorly managed part of our society’s cultural infrastructure, or both. The eroding Venice Beach Jetty: An example of poor beach management. Sometimes folks from afar tell me that only the wealthy or powerful frequent the beaches here in SoCal. Nothing could be further from the truth. Every fall for the past decade, students in my ESRM 462: Coastal and Marine Management Class have conducted face-to-face surveys in Santa Barbara, Ventura, and northern Los Angeles Counties, talking to somewhere between 1,000 and 1,500 people each year. 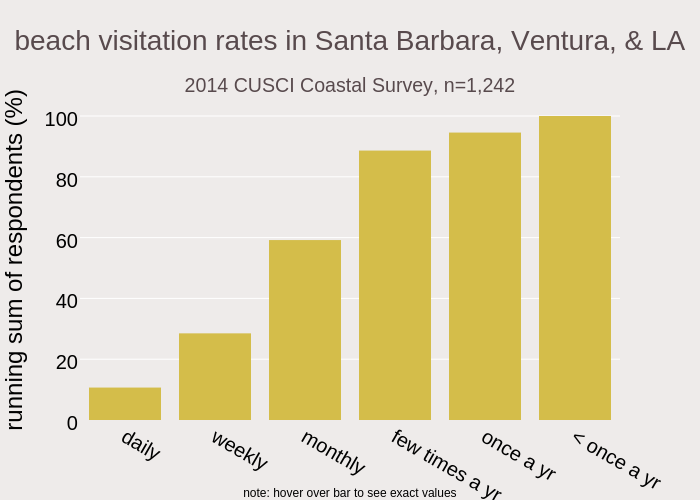 Our CSUCI Survey of Public Opinion of Coastal Resources is (among other things) a longitudinal survey of opinions and behaviors surrounding sandy beaches. This instrument has shown us that the vast, vast majority of us go to our sandy beaches all the time (see page 35 here or this link for the most recent summary of our data; note: an updated publication will be out in the next few months spanning a decade of data). For example, our most recent data from our 2014 surveys showed that when we asked folks to identify the last open space they visited, 78% of them said “the coast” or something to that effect with 60% explicitly naming one of our local sandy beaches. When we ask them how often we go to the beach (see below), a third of us go to the beach weekly. If we up the timeframe, we see that two-thirds of us go monthly and essentially everybody headed out at least a few times (89%) in 2014. These beach visitation rates are robust: household income has little to do with explaining this variation. And while people living in ZIP Codes that touch the coastline are more likely to spend time at the beach, we see very high visitation rates from folks across all SoCal ZIP Codes/geographies. Similarly, people whose first language is English are as likely to go as native Spanish speakers. The beach really is a resource for us all and part of our shared Californian heritage. The ubiquity of our beaches and our high frequenting of them seems behind the almost visceral response of the public to oil spills on beaches. I am seeing this exact phenomenon play out at the Refugio Oil Spill. As we have been sampling our beach monitoring sites in northern Santa Barbara County these past several days, we are constantly bumping into people asking what we are doing and then telling us how angry/sorry/beside themselves they are. They reiterate the hurt they feel and often will segue into a key beach memory or favorite beach-going activity. It has struck me that this is very similar to what my family and friends say when we gather for a high school reunion or a wedding or a funeral. Our attachment to beaches here is deep. 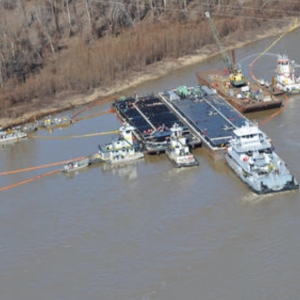 This spill, regardless of the size or net ecological impact, has struck folks in their heart. Lets get this stuff cleaned up and restore Refugio. 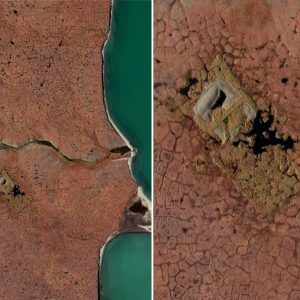 We want our beaches back.